How important is work experience for MS? How much is the work experience valued in the admission process generally? Let us be very clear – work experience is NOT mandatory. But it can help. It means that work experience is an added qualification and carries some weight just like your GPA, GRE score and application documents do. So, a student without work experience is NOT at a disadvantage in MS applications. Relevant core experience at a well-known company can matter A LOT. Relevant experience at an unheard company can matter if you describe your projects well. And LORs support well. Irrelevant experience hardly matters – here, it depends how you spin it in your story. Again, let me bring to your notice that this is very different in the case of MBA. But if someone has relevant work experience, then they can get some extra points and might be preferred over another applicant with similar profile otherwise but no work experience. The keyword here is – relevant. What does relevant work experience mean? Not all kind of work experience will enhance your profile. The one that will is what I am calling as relevant work experience. It is the experience accumulated in the same field in which you are applying. So if you are applying for Mechanical Engineering, your experience in mechanical industry (engineering role in auto firms etc) will help but your experience as a radio jockey probably won’t. Another thing to consider might be the length of experience – too short a work experience can only do so much while 1-2 years is a good period to be considered. By the way, the length of your work-ex considered is what you will have by the time you join graduate school and not the time of application. So, if you just graduated and started working, consider your work-ex as one year and not 5-6 months at the time of application. Will work experience help me get into good schools for MS? First of all, good is subjective. What is a good or bad school depends on your ranking criteria and inclinations. We at Scholar Strategy have been fortunate to drive awesome admits irrespective of the work experience. I have guided freshers who got into Harvard, CMU and Columbia and experienced folks who got into Austin, UIUC, Berkeley and so on. Shall I pursue MS right after college or wait and get some work experience first? Here’s how I look at it. You can obviously get better quality and higher paying jobs after finishing MS from a good university. So, why delay that and waste time on comparatively lower kind of work experience before MS? As we discussed earlier, work experience can help you get into better-ranked universities. So, if your profile right upon finishing college is not able to get you into good-best schools, you might consider getting some relevant work experience and apply in a year or two – again, note that only good and relevant work experience will help you. So, make sure your work profile aligns with your graduation goals. But if your profile is already good enough to get you into Top 50 schools, why wait? The downside of waiting is that you never know what will happen next year. Competition grows every year and you may or may not get a higher ranked school next year. That means, you wasted a year. I have a good job offer in hand, should I still go for MS? I applied to ten MS in CS programs when I was still in college. I had great gpa and GRE score but my college was not too well known. I applied a bit too ambitiously and ended up getting 9 out of 10 rejects. The only admit I had didn’t excite me that much. I had a job offer from a decent mid-size MNC as a programmer (so directly relevant to my MS in CS aspirations). So, I decided to accept that and apply again next year. I used some tales from my work experience in my personal statement and got one LOR from my manager this time. I got 5 admits, one being from my dream school – University of Illinois, Urbana Champaign. So, going for a job helped in my case since I felt I deserved a better school with my profile and did not want to sell myself short. And, it helped because I knew how to use it to strengthen my profile. If I had received a good admit in my first attempt itself (even if from a school lower than UIUC), I might have gone for it instead of working in India first because I could get much better offers after finishing MS. Secondly, as it happened, the Research Assistant stipend I ended up getting during MS at UIUC was more than the package I was working for in India. So, for me, it was a no-brainer. I was somewhat convinced that I can get into a much better school by improving my application a little bit which I did. The crux is to understand how much the work experience can help YOU (remember, it totally depends on your profile and there is no right or wrong answer). If you are not entirely satisfied with the admission you have (or think you can get) based on your existing profile AND there is an option of getting a relevant work experience that can enhance your candidacy significantly, then you should get some work experience before applying. Sometimes, working also gives you a perspective of what professional world is like. It may also help you understand whether MS is something you really want. If you have a good offer in hand (or can get if you apply) and a work experience can only help you marginally (since your profile is already great), then why wait to get that more awesome job upon finishing MS? Want to get into Top 30 school for Fall 2019? Join our counseling, only limited seats left. How much does work experience matter for MS? I’ve completed my engineering in electronics field & I’ve been placed in a good IT company via campus recruitment process. I haven’t yet joined the company. Now since my would be job is not related to electronics field what I want to know is that if I continue with my job, for say 2 years, and then apply for MS in electronics field, then will the job experience put a negative effect on my profile? Yes, if the work is not related to your core field and then if you apply for MS in ECE, then you would need to justify why you took and stuck to this job. Its not impossible to still build a convincing story but it wont be as straight forward as you can do now or if you took ECE relevant job. First of all its a great article,i have learnt a lot from your experience. My position is same as yours,i am preparing for GRE,IELTS.but now i think i should work for a year or two to enhance my profile.can you please tell me will it be difficult to switch back to learning-classes while working, and few more things upon the advantages of experience to MS-profile? Apply again for next year itself, don’t wait too long. Feel free to contact us for a phone chat. Its not at all hard to get back to school if you are motivated. Good luck. I’m 2015 passes out(Mechanical Stream). I wanna pursue my masters in Data science. Everyone says it may not be possible without relevant work experience Since Im a Mechanical graduate. What I’m I suppose to do? I’m taking up prerequesite courses relevant to the feild and preparing for Gre and Toefl. I really need some help on deciding whether going for MS will be good for me or not. I have completed B.E. in Computer Science in 2011, but was aiming MBA from GMAT, but got a poor score of 550. Now am working in the one of the Startup in India as Software Engineer, and have total work-ex of around 4.3years. And thinking to pull-up my skills by doing MS in Computer Science, but only if i get into top elite IVY league universities. So can you please suggest me whether my profile is good enough to get there after getting GRE score or not. I m studying in 3 rd year be and hav decided to go for MS…i want to do my ms in vlsi…….. I am a bit confused that whether i should go for a job or go for doing MS..?? If i got an IT job….should i go for it…or should go for doing my MS…….if i got a job in my field of interest like embedded or vlsi field …what should i choose for a job in my field of interest or go for MS..?? One of our students was also from same field and was battling the dilemma of going for MS in his field or MIS or keep working. Feel free to call us and we can guide you. Could you please post a list of top 50 colleges you mentioned. How do we know which college is good for which branch? Is a branch-wise college rank list available? I have completed my engineering in electronics and telecommunication and currently have 2 years of experience in IT industry. I aspire to pursue an MS degree in Computer Science. Is my experience good enough to get me into good colleges for Computer Science? That will depend on the kind of work experience you have. It needs to be relevant to the field you are pursuing and substantial. If it is meaningful, then yes, you should be able to switch to CS for grad studies. Good luck. I am planning to pursue ms in fall 2015.By then,I would have completed 2 years of work experience as a software developer with a well known Indian mnc. (1 year in java development and 1 year in ui development).Will my work experience help in getting a better school as I have decided to pursue ms in mis..? absolutely, work ex should add more depth to your application. Most of our successful students were going for MS after 1-2 yrs of work ex. I have finished my undergrad and going to complete one year in Testing in an IT firm though I had done Electronics and Instrumentation in my undergrad. I was wondering if doing an M.S in CS will boost my career and if I will be eligible for the same. The only thing i am looking at it my Work ex should not get negated. i am a B.E (electrical and electronics ) pass out in the year 2011, from then i was working in private firm which does not provide any work experience and all. Hi. I did mechanical engineering and am working in my relevant field. I wanted to study in US. I have been going to classes but due to work commitments and pressure , am not regular and not able to prepare. So my main trump card is my relevant work experience of 2 years. Will it help ? I did my B. Tech in Electronics and Communication Engineering, but I was more into coding from the beginning, therefore I got a job in reputed IT company just 3 months ago. Now, I’m thinking of applying for MS in Computer Science and Engg after I get the work experience of 2 years. So, would it be easy to get an MS based on my work exp and also, how would be the job prospects in India if I come back to India just after MS? Hello, I am bit confused about applying to US for post- grad.Actually I am pursuing my B.tech(4th yr) in Electronics And communication but want to apply for Ms in MIS. Have got placed in good IT firm as software developer, so would you recommend me to go for 2 yr of work ex. and then apply for Ms In MIS or strt. away go for it. Gre is btw 305-310. decent LOR and Sop. I have completed my B.E in Electronics and I am currently working in reputed MNC. I have 1 yr of IT industry in the field of testing . Also I have given gre and have a decent score (320). I wanted to do MS in Electronics field like VLSI or Embedded System ,but I don’t have other experience like internship ,research paper publication etc. So is it good to apply for MS now or wait for some time to gather more IT experience?? Hello, currently i am working at good mnc as an oracle dba. I have interest in data mining and want to persue ms in the same from a good university. I am sure i’ll get a good LOR from my manager and ive scored 328 in gre. However, my gpa is 2.3(on a scale of 4) but the gpa vs time graph is an upward U. Will i be able to get a college in the top 50? hi, i’m in my fourth year doing electronics and telecommunication engineering. i got placed in one of the big fours as a business technology analyst. but my joining is 6 months after i pass out. i had scored a 309 in gre although my academics are pretty god so far, so is it better to work for a year and a half and then apply or just apply right away? I’m having 2 years of experience as hardware engineer in vlsi domain. I’m thinking to do ms vlsi for fall 2015. (3 years). Is it good idea to do now. The only reason is to earn more money as pay here is less . Does this job experience usefull to get better university. Currently I am doing my B.Tech in Electrical Engineering and I am in my final year. But my college is not well known and my academic record is average(78% in 10th, 58% in 12th, 73.11% in B.Tech till now). So I am confused on what I should I do. With this profile will this be correct for me to persue MS in USA. I really want this so should I go for TOEFL and GRE right away or opt for a job and gain 1yr of experience and preparing side by side. Will that be OK if the LOR is from the manager of the company or should it be any professor from the college itself. You are already late for Fall 2015, so you have one year before you can join in Fall 2016 now (assuming you go ahead with your applications for it). So, yes, you should work for a year now and apply for 2016. LOR requirements are given on the school websites. They usually ask for at least 2 acad LOR, you can get one from your job. Hello, i am currently pursuing B.E in information technology(4th year). I am planning to go for fall 2016. I have a job offer but as I will start my application from around october so should I take up that job as it won’t account for any experience. Thanks in advance. I have done my graduation in Electrical & Electronics field and currently working in a renowned IT firm from 6 months. What are my chances of pursing MS in Management Information Systems(MIS) if my GRE score is 315? this information is pretty much beneficial. I am in a great confusion. I completed my b.tech in 2013, from ECE and applying for MS in EE fall 2015. I have a work experience i.e teaching experience in engineering college. will this help me in my MS application??? I have exp in my core subjects. Shall i apply with this experience… will this add points to my profile??? or should i go with some other exp… Please do reply…. it would be a great help for me. I have got an admit in MS-IT in UNCC. I applied for 7 univ and totally 5 univ rejected me.I even have 3 job offers in hand(Infy,wipro,cts). I am currently a final year student from a reputed college. Which would be better, Choosing job or doing MS. At this point im afraid of the studies and assignments to be done, i thought with an experience i could learn..suggest me? I plan to go for MS in CS after 2 years of doing job. Currently I have 2 offers for software developer role , one from a well known brand (Amazon), and other from a start-up. Which job offer should I choose, keeping in view my higher studies plan ? Which offer will give me an advantage while applying or post my MS ? Both can be helpful since Amazon is a good brand name and startups carry some value too.Go for the one where you think you will learn more. If startup profile is good, you can consider it else Amazon is a safe bet. Currently I am pursuing my final year mechanical engineering from pune University with a very good GPA. I am planning to take admission in fall 16 and work till then and join some classes for preparation. So when should I take my gre so that I can apply for fall 16. And I am bit concerned about doing ms in us because of the hype that it is not advisable to do ms in mech in us, so could you please suggest me some universities also? I am having 2 years of Work Exp in India as Software Developer.. I want to pursue MS in CS from a good reputed Grad School in USA. After Pursuing MS i will work there for about 2-3 years (Provided i get JOB).. So, after having valuable 3 yrs work exp + MS[CS] Degree will i get a good opportunity/JOB in INDIA. This is b’coz i have my parents dependency on me but i cannot let go my dreams. I am working in indian IT startup for nearly two years. And my now concern is that my work exp in startup would play major role in to do MS in US. Because i am started the groundwork for GRE and IELTS. Could you assist me in this? while applying for universities i would have completed only four months but when joining i would have 10 months, so when applying how should i put it 4 or 10 months of experience. I’m an IT engineer now. I’m confused, will working as a Web Developer for 2 years count as an experience if I want to pursue CS in MS?! I have 60% aggregate in my BE in ECE (electronics) stream ,i am planning to pursue MS in US but i dont have work experience and i am preparing for gre and IELTS also ,whether i will get good US universities with my academic score or should i apply for MS after working in IT company? I have around 4.5 years of experience of application development and maintenance from CMM Level 5 companies. Since last 2-3 years, I have developed a set of interest in database and I want to grow further in the same field. Because of the mentioned reason I am planning to pursue MS in Computer Science with specialization in Database from USA. Will this step be worthy for my career. And does my experience will help me to fetch job in USA or will I be treated as a fresher post the completion of MS. I have near about 3.5 years of experience in IT industry.And right now am thinking about the MS. but have a little time for preparation as am now 26 years old. and my aggregate is 56% .is it fine to go with MS? And Shall I apply to Maryland(college park),UCSD and TAMU? I have done my B.Tech in ECE and now i’ve 3 year of experience in IT MNC as developer. is it a wise decision to do MS in US since by the Fall 2016 i wud have almost 4 yr of exp. I have 2 years of work experience from American automotive company, btech of 6.5cgpa and mtech of 8.1 cgpa but my gre score is 150 quants and 140 verbal do u think I have a good chances of getting industrial engineering from any moderate university? By the way.. IS both the ways are good for my career ? As you can see, there is no right and wrong ans to this question. If you feel ready and confident, you should try applying and get a good admit. Hii Nishita,I’m a 2016 passed out..I got good grades in school and intermediate around 90% and 95%..I got a little deviated from studies in B-tech..Though I’ve some eca done in college,I think those doesn’t justify my low grades in b-tech with 63.4 %..I’m from EEE..Now,I want to be back..I want to do hardwork..I’m confident in getting good GRE score..I want to do MS in CS..I did a certificate course on Java Devops..I’ve a offer from startup as an Intern followed by Job offer but I didn’t like startup(I felt the team is not much knowledged)..what should I do ?? I want to Ms in 2018 spring,…Is it too late ? Hi.I have done M.tech in Embedded systems.I have 2 years experience in Embedded systems field.Now i want to do M.S. in Embedded systems in canada.Plaease let me know the collages that are offering M.S. in Embedded systems in canada.And will my 2 years experience help me?Thank you.. I completed my BE in IT from a lesser known college in Mumbai university. MY acads is 62% and gre score is 309(V-152,Q-157,Awa-4) and toefl is 102. I have no work experience and I am not much into coding. What are my chances of getting into a good univ for MS in MIS? are the job prospects good for people like me with no exp, after doing MIS? Should I wrok for a year and then apply? Hello, I have 2+ years of work exp in development. But I genuinely love thinking on algorithms and data structures. So I am inclined towards MS in CS with machine learning or Data science electives. Would my work experience be given a regard in this case? I do not want it to go to waste. Also please suggest what course should I select to do MS in. Hi I have done ECE 2012 passed out ..I have an average academic scores. ..10th 87% 12 th 79% uG 7.95 cgpa.I dont have any experience for 4 years ..I have a strong desire to MS in US .is tat possible to get into good US university with gre score 325 tiefl 115 ? How is a ” good profile ” is judged ?? ..!! Can i know what that means a person with no experience ? how can one judge his/her profile? What are the basic parameters that judges a good profile tag ?? Can u state a sample of gud profile ?? I am a B.Tech student in CSE 3rd Year with a CGPA of 7.5. I will be taking GRE in early 2017. Should I go for college placement or apply for MS next year? And is my CGPA enough for me to apply for MS without any job experience? I am a BE ECE graduate with good acads. I intend to apply for MS next year. I have an IT job offer at hand. If I get 1 year work experience and also do some embedded system related projects on my own during free time, will that be considered as positive for MS in Embedded System and will it help for job hunting after MS? I did my B.tech in ECE. Worked in software company for more than one year. Now am planning for MS in Electrical Stream. Please suggest me how to be convincing and justify this while writing my SOP. I did my B.TEch in Electronics and instrumentation. Currently working IT industry for 2+ years.i want to get back to my field .iam hoping to do MS in instrumentation related field.what would be your carrier advice on this? or would you suggest to use the work exp wisely and apply for courses like MIS ? I am really confused about my situation right now. I got a job after my engineering and before joining I gave my gre, got 312. But i think it’s not good enough. And I think i can do it better next time. But the company’s training is gonna start. And i don’t know, i would be able to cope with both training and studying. I am not sure what to do. High gre score or 1 year experience. What should i choose? It would be really helpful, if you could advice me on this scenario. i have completed my be 2013 from ec and then i worked 1 year in consultancy since 2014 i m not doing job so is worth for me to go usa and persue ms in mis as i am not have relevent experience . 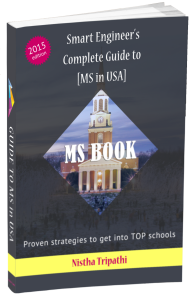 Hello, I have just graduated this year and started my post graduation to improve my profile, now after my first semester i have received interview call from great company of my domain, my ultimate goal is to do MS from a good college, what should i do…. I am a student of ECE and got job in IT company. I want to do biomedical engineering after getting work ex of 1 or 2 years. Will my work ex be beneficial for my profile and getting a good university? I am in final year (8 semester) of btech in electronics and communication with not so good cgpa (6.8) and i am doing my internship in electronics company they will provide me electronics job, i wanted to do MSC in canada. Which option is good for me or what do you i think i should do? hey, i m currently pursuing BTECH in COMPUTERS and will be graduating this May. I intend to go to Canada for MIS this fall itself. Will i b eligible enough or do i need to have a work experience? Please help me out with it as people here say that i should do a postgraduation certification course in Canada as without work experience i would not be able to get into any university. What is your opinion about it? I am currently working in JP Morgan as a Tech Analyst with an experience of 3.5 Years. I work here as an L2 Application Support. I am planning for MS in Fall 2018. While applying for Admission i will have almost 4.5 years of experience. My reason for Going for MS is my GF. She is doing MS and by 2018 end she will complete it and in a year or 2 we will get engaged. Having 4.5 years of experience and applying for MS , will it be good for me ? Will my experience help me to get a good college ? Please help, i am confused on what to do. I have done my graduation B.tech(CSE) from Galgotias University in 2016. I got 68.5 cgpa in B.tech. After working 4 yr can i apply for MS in USA ? I graduated in 2011 in Electrical Engineering. I did some work for a contractor for about a year after that due to some health issues I focused entirely on government job as the rigorous routine of a private job would not have suited me. Now after 6 years of futile efforts of trying to get a government job I am left completely worthless for the private sector and I still dont have a government job(after 2012 I did not do any job what so ever). Is it too late to think of a masters degree from a US university. Firstly, thank you for writing this article. Its so much help. i am Ujjwal in Btech 3rd year in Electronics and Communication engineering.. I want to open a start-up in my own field after college..
Im not sure whether i should go for MS for that or not.. I was thinking to sit for placement, join some company, learn their craft and then open a start up.. So is MS going to be beneficial in this pursuit? HEY! I would like to know if colleges are very particular about work experience while pursuing MS in Engineering Management. I graduated in 2016 from not-so-known college. I am currently working with an MNC for 8 months and I have a bond until January 2019. I want to pursue MS and leave the job because I feel like I am degrading my knowledge here, but I won’t get an official letter of work experience unless I stay till 2019. Should I leave the job, and prepare for GRE and start applying for 2018 or should I continue my job. Will I make it in time for 2018 fall semester? I am also working as a freelancer for a startup in my home town for a year now and have experience letter from them. Really upto you. I know people who did not wait for the bond to finish and went ahead with MS. Why do you need to leave the job for taking GRE though? You should take it while at job and then decide when to apply. I’m working as a software developer in a startup where we do all the work starting from R&D then development and even testing. I can even get the LOR from my CEO who has a great past in software industry. The only problem is that I scored 305 in GRE so should I apply to colleges ? Is there a chance of getting admission into some good college or should I give the exam again ? I’am confused ! I have done Bachelor of Engineering in electrical engineering. I am currently working in a petrochemical industry as a maintenance engineer since last 3 years. Should i go for masters degree in electrical engineering or continue with my job. Job giving me decent pay not too high or not too low. but i am not that much of satisfied with my job. Due to indian job market i am not getting another job with same or higher pay in other field. Please suggest. Hello sir, I have done Btech in EEE and I have 3 years of experience working in vlsi r&d. I have only 58% in BE due to some reasons. I want to go for MS in vlsi. I want to know whether I can get admission into MS to some good university or colg or not based on experience. I went through your answers on quora, they are really helpful for many people like me out there who are aspiring to do MS abroad. I am a 2016 grad from civil engg from one of the IITs. I have been working in a startup since then as a web dev. I am planning to go for MS in the AI field in spring/fall ’19. Can you please help me understand whether this work ex I have will add any value to my profile in any way? It is relevant for CS at least, rest depends on how you spin it. I have completed my Bachelor degree in CS and i got good grades in it and then i took a drop of one year to prepare GATE but due to some reason my GATE preparation suffered from Ups and down so i couldn’t make it well …so i made my mind to go broad and study MS but it will take almost one year for me to join abroad university …so my question is does my 2 year gap (may 2017-dec 2018) will affect my career abroad ? Bad news – gap is not good, you must show that you made some productive use of that time. I graduated in 2015 with a Bachelors in Mechanical Engineering but couldn’t break into the core job domain. Now i have 1.5 years of MIS experience at a company. Can i use this experience towards graduate applications for automotive engineering? Kindly suggest. Depends on your project really but it will be tough if the work ex is completely irrelevant. I will pass out from college/will be done with my final exams BE(CSE) this May 2018, and I have been placed in Zensar Technologies(MNC),Pune. I will be signing a bond of two years with the company. 1.Should I study and sit for GRE during this free time and then after two years apply using those score? 2.If I join in 2018-oct and will be leaving the company by 2020-oct, when should I begin with the procedure of LOR,SOP and GRE examination(If not taken before/need to take it again for good scores)? Just want a timeline. 3.TOEFL score is valid only for 2 years, when should I take TOEFL? If you have done 3 years Bachelor’s only, then you may not be eligible in most of the schools since they require 4 years of undergrad. You can check with some of the universities to confirm. You can either enroll in ME in India, apply for MS and leave after 1st year if you get in or you can try finding countries or schools that are ok with 3 year BSc. I am a 4th year ECE graduate . i got a job via campus placements into IT sector which is my interest area . I have an internship in the same sector too . But i have a cg of 7.5 . Is there a chance that i may get admits from universities like berkeley , UCSD for masters ? or any good university for cs for that matter ? I have completed my Bachelor’s(CS) with descent score .and for past 2 years am working for a MNC in testing profile.As i wanted to grow in the Data anlytics feild, i have done some course related to data analytic during my free time.Now planning for MS in Data anlytics. So in this scenario, Is my work experince is considered ?.or should i have to gain work experience in data anlytics and then apply for MS? currently am preparing for GRE and IELTS. Can i know how to contact you for further details ? I am a 2017 Mechanical Engineering passout from NIT KKR Planning to give GRE in May.I have a work experience of 6 Months in a core MNC and after that i am working with MNC and its been 4 month i am working with current MNC. I have my interest in Thermal Engineering and want to pursue MS from USA. I have a doubt regarding my work experience will it make a negative impression of changing job within a year. Or i should provide extended experience of a single company? take the job which is more relevant to what you want to do eventually. And what has already happened cannot be changed (assuming you have already switched jobs)? So instead of worrying about it, focus on your GRE and applications ahead. beyond this, cannot help you personally here. For that, you need to join our paid counseling. I am a 2017 graduate, currently pursuing job in a completely unrelated sector from my core branch Biotechnology. I wish to enroll for fall 2019 session for MS in Life Sciences. I have further received an offer from a “Big3 Firm”. Should I go ahead with this job offer or take up research assistant training to validate my candidature for MS course? Please help. Cannot guide here without knowing what your work will entail. That is possible only with our paid students. Good luck. The work is purely management consulting and nowhere related to life sciencentre technicalities . I raised this query since you mentioned of taking up job with big3 or Facebook. I am a MS aspirant for Fall 2017 Data Science. I had a good profile but I applied to ambitious schools and got rejects from all. The one I do have an accept from I am not too keen on joining but I don’t even have a job in hand.I have started looking for one as I feel one year work exp could be very helpful to get me in my dream university Columbia. Find a relevant job, work hard and apply early. We need more details and time to guide individually which is possible only for our paid clients. Good luck. Hello. I will be graduating with a BTech in ECE this yr and i have been placed in Deloitte as Technology consultant and also have some admits for MS in Data Analytics from a decent school whose DA program is among the top 20-30. However since DA is an upcoming field will my work ex at Deloitte help me get a better university and program or should I just as a fresher without much knowledge in DA subjects go for MS in DA? i am mechanical graduate in 2014.having 4 years of work ex in Linux (IT). does it worth to do MIS from USA. as my education and work ex is totally different,does it make any effect in getting job.also does 4 years of work ex is ideal to apply ? If needed I can provide further details for a better evaluation. Thanks in advance. I am an MS aspirant for fall 2019, graduated in 2017 and having 1 year work exp in core, well known industry. i do look forward to apply for top univ in canada like alberta, mc-gill, waterloo , concorda, calgary. 7.62 cgpa in EEE background, no paper publishments but do have 2 internships at well known industry and a research project at my academics, with many hobby projects well suited for industries. what chance do i have to get an admit? I am planning do MS in Computer Science from CN for Sept 2019 intake. I have completed MCA in 2009 with 72% . Now I have 8+ years of work experience. I heard that CN Universities wont accept the students who has more than 5 yrs of experience. Could you please shed some light into this matter whether is there any possibility for me to get admission in CN universities ? Nistha was very helpful in giving advice about sop. She also organised webinars regarding internships which were quite helpful. I opted for counseling from Scholar Strategy primarily to select a college that suited my individual and technical needs. Nistha was a great help being open to any discussions and she focused over my particular interests. Her technical experience in the same field helped me better. I can say Scholar Strategy did great for me. I would like to thank Nistha for her constant support during my application season. What I like about her is that she is very candid and straightforward. I drastically improved my SOP and it was UNIQUE. She always provided feedback which could really help see things which are usually neglected. I got good admits and in case I wish to go for further studies, I know i will get in touch with her. Nistha is an awesome person. Always up to help you and guide you. Thanks Nistha for so many SOP reviews. I don’t think, it would have been possible without your help and guidance.